Cost tracking is one of the most powerful features in Control. Control's abilities to automate bills of material, record material and labor usage, and then determine corresponding costs give the owner/manager a deep set of tools to understand their business. Control offers several ways to set up your costs. Deciding the right way for your business is an important consideration. This section tries to identify the options available to you in Control. You can choose how to track parts on a part-by-part basis. Some parts might be tracked using accrual accounting, some with cost accounting, and others still might be included for information purposes only and not costed at all. To accrue is to accumulate, collect, grow, or increase. If you are reading this, you probably already understand the basics of accrual accounting, but a simple recap of how it applies here is in order. Note that the inventory is not expensed (and doesn't show up on the Income Statement) at this time. When the inventory is used in an order with WIP or Built status, the cost of the inventory is deducted from the Inventory Account. It is not desirable, however, to recognize the expenses until the order is in the status of Sale because the income from the order is not realized until than time. For this reason, the costs are transferred into a holding account called “Cost of WIP & Built”. The Cost of WIP & Built Account will accumulate all charges incurred (through the creation of material usage cards) for orders not yet a sale. Once the order becomes a sale, these costs are then recognized as expenses. For wages, equipment, and other parts, Control allows you to set up Accrual Accounts to track the value of these costs. For example, Labor can be accrued on orders and wages and paid directly from the accrual account. This permits the capture of this information on the balance sheet in real time. Cost accounting focuses on determining the manufactured costs of the goods sold. In Control, cost accounting tracking is a supplement to financial accounting. There are many reasons that users do not wish to track or inventory all of their parts, but the root cause tends to be that the cost of financial tracking exceeds the value. As an extreme example, imagine you own a small pizza business, and one of your costs is oregano for the pizza sauce. You could track the oregano in your inventory, and each time you make a pizza you could measure the amount of oregano and deduct it from your inventory. When the pizza is done, you record your expenses and find you spent about 5 cents on oregano. Since this is a small operation, you decide that it isn't worth your time to measure the oregano and you aren't going to track in on your inventory. Hence, financial accounting is a bit of overkill for this item. Control gives you the option to track the costs only, which of course can be estimated in a consumption formula. You can assign the computed charges to the order for cost tracking only. These computed charges don't show up on the Income Statement. Instead, the oregano already showed up when you wrote the check and did not put it into inventory. This is the essence of cost accounting in Control. In Control, computed costs and financial costs can be used in the analysis of an order's estimated profitability. However, only the financial costs show up in the financial statements. Computed costs are simply for managerial purposes. An often confused point is the distinction between accruing costs and inventory. In Control, you may choose to track your inventory levels or not on a part-by-part basis. 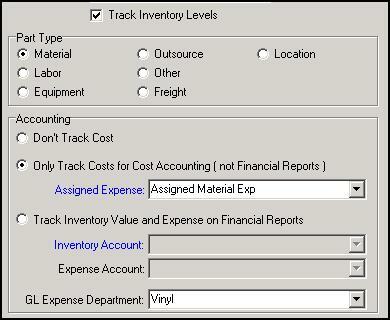 If you choose to track inventory levels for a part, you can also choose to accrue the inventory value and reduce the value as the inventory is used. If you are not tracking inventory, then you may not accrue the inventory value. The choice for these is found in the part setup. Each of the three cases is considered below. If you are not tracking costs, Control will still allow you to track inventory. However, unless you are tracking costs there are no costs to consider. No financial or cost-tracking entries are made. Another option in Control is to track the costs associated with materials for cost accounting but NOT for financial reports. This is most commonly used for tracking costs associated with non-inventoried parts, though it can be used with inventory tracking enabled. When Tracking Costs Only, no general ledger entries are made associated with the part. Instead, costs are tracked in a computer cost ledger and show up in Cost Accounting analysis only. Computed costs can be reviewed and studied when analysing estimated order profitability, but do not appear on the Income Statement or Balance Sheet. When inventory tracking is turned on, the levels of inventory are also tracked. However, there is no inventory valuation for the part on the balance sheet. Therefore, adjustments to part cost and inventory balances do not show on any adjustment to any financial or costing reports. Computed Costs Accounts: Computer Costs Accounts are used to track the costs associated with consuming materials that are not shown on the financial statements. Computed cost accounts are analogous to expense accounts, but do not show up in the Income Statement or other financial reports. Computed Costs in WIP & Built: This computed asset account “holds” assigned costs that are recorded before the order is a Sale. These computed costs are then recorded when the order is a sale. This option allows you to accrue the inventory value and charge it against the Income Statement as the materials are used. This option fully implements the financial elements of an inventory system. As such, this option is only enabled when inventory tracking is enabled. Inventory Accounts (Raw Materials): Each part may specify a GL asset account used to track the inventory value of the part. Different parts may use the same Inventory Account or you may create unique inventory accounts for each part. When inventory is added (through a bill or manual adjustment) the Inventory Account will increase for that part. When the part is used, the Inventory Account will decrease by the value of the amount consumed and increase the Cost of WIP & Built Account. Cost of WIP & Built Account: This asset account “accrues” the costs used for orders in production that have not yet been recorded as a Sale. When the order is marked a sale, these costs are transferred into the appropriate Expense Account. This account is a system account and cannot be changed or edited. Expense Accounts: Each part must specify a GL expense account used to track the costs of the part used during production. Charges for material are recorded against Expense Accounts when an order is marked a Sale. Different parts may use the same Expense Account or you may create unique expense accounts for each part. Inventory Adjustment Expense: This system expense account is used to record all manual adjustments to inventory valuation or quantity under this option. This account is a system account and cannot be changed or edited. If adjusting the inventory quantities adjusts the inventory valuation, Control will create offsetting entries in the Inventory Account and the Inventory Adjustment Expense. Similar entries will be created when adjusting the parts cost. When posting bills for inventoried, accrued parts, Control will adjust the inventory account and the Accounts Payable account. If the cost of the newly purchased items does not match the inventory cost, the user may choose to adjust the parts costs or not. If the part cost is NOT adjusted, the new quantity is added to inventory at the old price, and an adjustment is made into the Inventory Adjustment Expense. Part of the job-costing tools Control provides is the ability to associate non-inventoried expenses with an order. The costs for inventoried expenses are determined by the inventory valuation, and handled as discussed elsewhere in this document. In Control, Purchase Orders, Receiving Documents, and Bills can all be associated with an order (or even a line item on an order). Further, each line item of the document can be associated with an order (or a line item in the order).